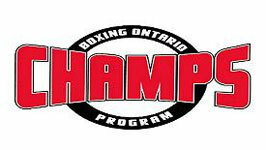 Currently, coaches registered with Boxing Ontario are eligiable to attend the CHAMPS Program. Please contact Erik Espinola at 416-426-7491 or email for additional information. To provide clubs with a program that they can use to recruit NEW Boxers into their gyms. to provide a systematic progression of an athlete’s development from the initial stages grade 4 (age 10) to the highest levels of completion available and follow the LTAD( long term athlete development model). to provide a comprehensive development program for clubs to utilize so as to promote the necessary skill progression for athletes to follow regardless of their age, gender, ethnic background, skill or ability. to provide clubs with the necessary benchmarks for athletes and coaches to follow therefore developing a more consistent athlete across the Province. Also included is information regarding Funding Support, Fitness Practicals, Skill Evaluations and Lesson / Practice Planning. The following coaches and clubs are now active in the CHAMPS Program.